I use GarageBand quite a bit, and like most people, I’m drawn to its ease of use. However, until now GarageBand’s guitar rigs were nothing to write home about. Typically, when I use GarageBand, it’s a recording and organizing tool, not necessarily a guitar tool. 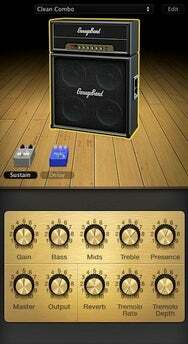 I would use AmpliTube, Guitar Rig, or Pod Farm for my guitar modeling and use GarageBand as my sketchpad. To be honest, that system has worked well for me, but with the release of GarageBand ‘09, I decided to give the amps and effects another try. First off, it no longer feels like GarageBand was designed primarily for keyboard players. With a fancy new interface, GarageBand now gives users more visual cues to make adjustments to their guitar amps and effects. What’s really interesting about the new release is that the amps have been completely remodeled. In other words, Apple didn’t just slap a fancy picture on the previous amp and call it new—at Macworld Expo, Apple told me it was actually proud of the fact that so much work went into the amps. That’s good news for all of us. The effects have been remodeled too, so you should be able to get a more accurate sampling of sounds when making adjustments to your guitar rig. Apple includes five amp models in all, including a Marshall, Mesa Boogie, and Vox. 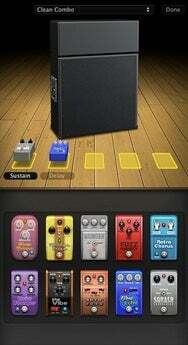 There are 10 effects too, including some of the most popular for guitar players, including Phaser, Flanger, Fuzz, Compressor, Overdrive, and Chorus. The guitar interface is split horizontally, showing the amp and pedals on top, with the fine adjustments on the bottom. To add a pedal to the current guitar rig, you simple drag and drop it into the top window. Once a pedal is in the rig, you click on it to bring up its controls in the lower part of the screen, letting you make fine adjustments, just as you would with an analog pedal. You can add up to five effects per track. The amp works the same way. Click on it and the adjustments for the amp come up in the bottom window. Apple includes the same controls for all of the amps, which is a bit different than what other amp modeling companies do. Typically, amp models stay true to what controls the real one has on it. Inserting pedals into your guitar rig. Apple has controls for Gain, Bass, Mids, Treble, Presence, Master, Output, Reverb, Tremolo Rate, and Tremolo Depth. You will find the same controls no matter if you use a Vox or Marshall model. In addition to being able to create and save guitar rig presets, Apple also includes 37 presets to get you started. The names of the presets give you an excellent indication of what type of sound they offer—Country Twang, Bell Bottom Rock, and Big Hair Metal, for example. The rest of the presets are similarly named. Overall, for guitar players, Apple did a really nice job with GarageBand ‘09, although I would still like to see the ability to use dual amps.